I had the delight of interviewing Bertrand Mak today, the brainchild behind the 23 Carat Gold Collection for Rupert Sanderson, exclusive to Hong Kong. He is a gent of the highest order, impeccably dressed, well spoken and has a great sense of humor. The shoe line they collaborated on is fabulous and they have redesigned the famous "Hong Kong" shoe in complete 23 carat gold leaf, as well as adding gold heels and details to 9 other styles. Here are some snippets from my interview with the man himself. Bertrand started off his career in luxury retail as a management trainee at Louis Vuitton, after this he went on to Christies. He is currently collaborating with Rupert Sanderson in Hong Kong as they present the Gold Collection and is in the process of launching his own watch and leather goods range. The watch he is wearing today played a key role in the collaboration between Rupert Sanderson and Bertrand. On his way back from Switzerland to visit the watch maker who he was collaborating with, he stopped over in London with his girlfriend. They stumbled across a magnificent shoe store where they purchased a few pairs of this fabulous designers shoes. 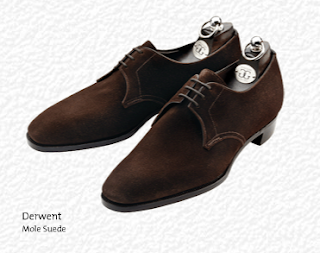 Once in Hong Kong Bertrand noticed that many people were admiring his partner's shoes. He contacted Rupert Sanderson with the proposition of launching in Hong Kong and the rest as they say is history. His own shoes, from Gaziano and Girling are quite aptly magnificent, he was sporting this style. The style stakes in Hong Kong have suddenly gone up a notch. Bertrand Mak has sophisticated cool down to a tee and he's going to let you gents have a piece of the pie very soon. Shoes are available to purchase in the boutique on 8 On Lan Street, Central and will be available mid-June online.